As you might expect from a pedigree such as Slinky, after a short break from releasing tunes they are back with a bang. Johan Ekman delivers that bang with this superb two track EP. This accomplished producer has had his tracks and remixes grace the decks and radio shows of pretty much everyone that counts through his career and here he delivers two tracks that show exactly why. Spinned takes a melodic big riff route whilst Turn Out delivers full on heads down tech trance of the highest quality. 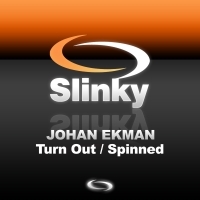 'Turn Out / Spinned' is available now from Beatport and iTunes.